the lower and middle Mississippi Valley and Ohio Valley. eastward into the Ozarks during the overnight. Really impressive dryline across central/eastern Oklahoma on Tuesday. I'm a little worried about the warm nose near 800mb shown in some of the forecast soundings. 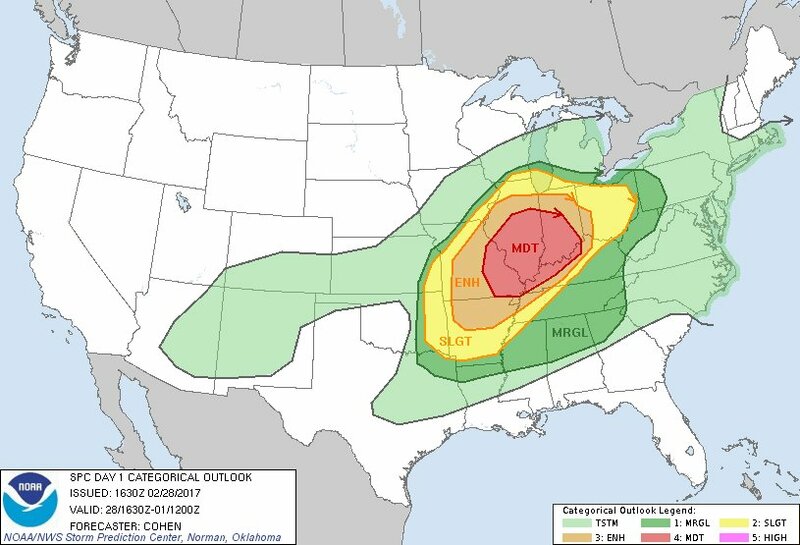 They expanded the enhanced risk north into Illinois. EF-5bigj wrote: They expanded the enhanced risk north into Illinois. I need them to shrink it and/or move it south of 36N so I don't have to worry about it. Areas most likely to be affected? There is still some bust potential due to a cap around 800mb and a lack of forcing during the evening in AR/MO/IL, but anything that does fire may find itself in a very favorable environment after sunset. Looks like they expanded the Enhanced area again for both days. Fifth Anniversary of the Harrisburg, IL EF4 that claimed 8 lives. Touchdown was just about this time of morning, just before 5AM. Well you don't wanna here that "Nocturnal significant tornadoes"